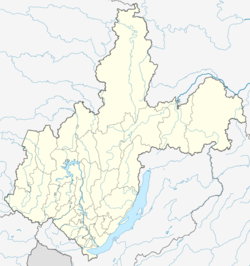 Alzamay (Russian: Алзамай, IPA: [ɐlzɐˈmaj]) is a town in Nizhneudinsky District of Irkutsk Oblast, Russia, located on the Toporok River (Angara River's basin) 600 kilometers (370 mi) northwest of Irkutsk, the administrative center of the oblast, and 90 kilometres (56 mi) from Nizhneudinsk, the administrative center of the district. Population: 6,730 (2010 Census); 7,383 (2002 Census); 9,029 (1989 Census). It was founded in 1899 as a settlement around Alzamay railway station. Town status was granted to it in 1955. Within the framework of administrative divisions, Alzamay is subordinated to Nizhneudinsky District. As a municipal division, the town of Alzamay is incorporated within Nizhneudinsky Municipal District as Alzamayskoye Urban Settlement. Законодательное Собрание Иркутской области. Закон №86-оз от 16 декабря 2004 г. «О статусе и границах муниципальных образований Нижнеудинского района Иркутской области». Вступил в силу с 31 декабря 2004 г., но не ранее чем через 10 дней со дня официального опубликования. Опубликован: "Восточно-Сибирская правда", №254–255, 20 декабря 2004 г. (Legislative Assembly of Irkutsk Oblast. Law #86-oz of December 16, 2004 On the Status and Borders of the Municipal Formations of Nizhneudinsky District of Irkutsk Oblast. Effective as of December 31, 2004, but not earlier than 10 days after the official publication date.). This page was last edited on 3 July 2017, at 04:33 (UTC).